Just back from Utica, N.Y., where I did music on Saturday night for Harold Lloyd's 'Speedy' (1928) at The Munson-Williams-Proctor Arts Institute, a really nifty museum. Harold killed, as usual. And what a pleasure to be present as yet another audience discovered this film! Next up: heading out to Iola, Kansas this weekend for the annual Buster Keaton Celebration, held not far from Buster's birthplace in Piqua, Kansas. While there, I'll get to hear accompanists Ben Model and Marvin Falwell do music for several Keaton features and short comedies. Looking forward to it! 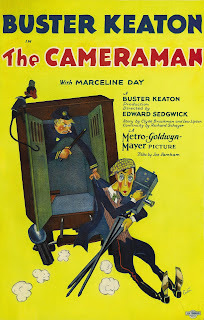 And me—I'll accompany Keaton's 'The Cameraman' (1928) and my share of short comedies, too. But I also get to introduce a new documentary, 'To Be Funny,' a contemporary look at Buster's enduring popularity. Why me? Because I'm actually in it, and the filmmakers couldn't be on hand, so they asked me to do the honors. It's the first time the film will be shown publicly. But to see a bit in advance, the trailer is posted online. Also online is a new feature article on silent film music and my approach to it. Published by the Boston Arts Fuse, it was written by Ken Bader, who did a very thorough job interviewing me and pulling this piece together. Thanks, Ken! Also while I'm out in Kansas, I hope to hop across the border for a long run in Oklahoma. If I'm successful, this will make Oklahoma No. 34 in my quest to run a minimum of 10K in all 50 states. If you'd like details, check out a page on my Running the 234 blog. When I get back from Kansas, we'll be entering the busiest time of the year for a silent film accompanist—the weeks leading up to Halloween. And yes, I have something like 12 shows in the two weeks prior to Oct. 31. Scary! To keep the Halloween season from becoming a 'Nosferatu' marathon, each year I try to pull a worthy thriller from the shadows and give it a chance at some screen time. This year, it's the original silent film version of 'Dr. Jekyll and Mr. Hyde' (1922), starring John Barrymore and a surprisingly scary piece of vintage cinema. But things worked out where I'm also accompanying a couple of screenings of 'The Man Who Laughs' (1928), the terrific Paul Leni film starring Conrad Veidt. So it make for a spooky good time. And remember: in silent film, no one can hear you scream. 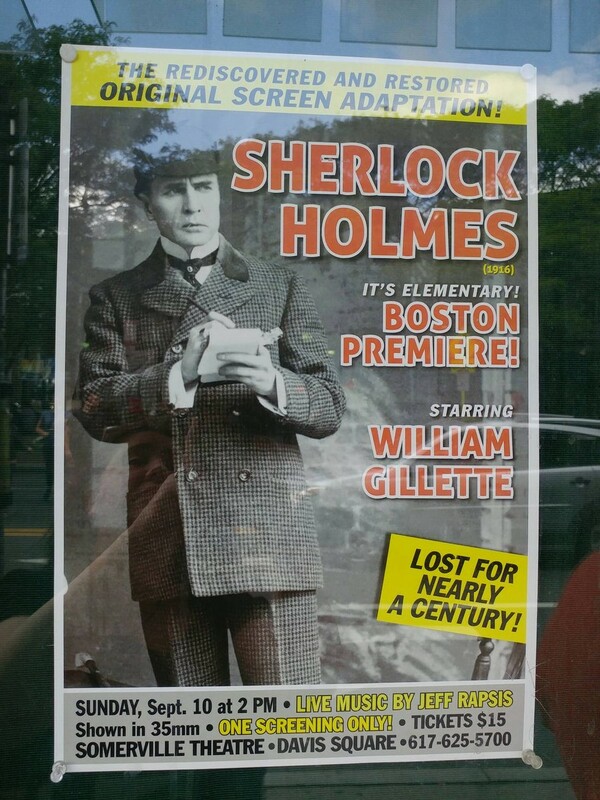 We enjoyed a great turnout of about 250 people on Sunday, Sept. 10 for the Boston premiere of the rediscovered 'Sherlock Holmes' (1916), which was shown in 35mm at the Somerville Theatre. But I'm already looking ahead to a crowded week of screenings that takes me to four different states in five days. Luckily, our states in New England are small, so they're all easy day trips. 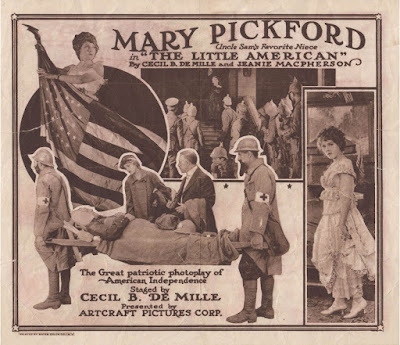 • Wednesday, Sept. 13 finds me doing music for Mary Pickford in 'The Little American' (1917) at the Cheshire County Historical Society in Keene, N.H. They're running it because the patriotic film played Keene exactly 100 years ago, after the U.S. had entered what we now call World War I.
Keene State College Prof. Larry Benaquist will lead a discussion on issues ranging from the film's propaganda value to Pickford's role as one of the pioneering women in cinema. The program starts at 7 p.m. and is free and open to the public. More information is online. • Thursday, Sept. 14 gives me the chance to revisit an early favorite: Richard Barthelmess in 'Tol'able David' (1921), Henry King's evocative rural drama. Shot in the Virginia countryside where King grew up, the film captures a way of life that hadn't changed in generations, but which now has completely vanished. In addition, the film boasts a great story and a fine cast, headed by Barthelmess (who Lillian Gish called "the most beautiful man" she'd ever worked with) and also including stalwart character actor Ernest Torrence playing one of the creepiest roles of his career. See it all for yourself at the Capitol Theatre in Arlington, Mass. The show starts at 8 p.m., and there's plenty more info in the press release pasted in below. • Saturday, Sept. 16 sees me hauling myself up to Brandon, Vermont for the latest in our monthly silent film series at the Brandon Town Hall. This time it's a double feature of rarely screened adventure thrillers starring none other than Harry Houdini! The titles: 'Terror Island' (1920) and 'The Man From Beyond' (1922). Yes, it's the same Harry Houdini known as the "Handcuff King," the legendary illusionist who amazed audiences around the globe with daring stunts and seemingly impossible escapes. Houdini, like many performers of the era, had a fling with the new-fangled flickers, starring in several silent thrillers designed to showcase his good looks, magnetic personality, and athletic prowess. The result was a kind of embryonic mixture of Indiana Jones-type adventure with mysticism, James Bond-style gadgetry, dangerous stunts, and anything else the plots demanded. Houdini eventually gave up on the movies in favor of live performance. But came to Brandon and you'll see what he was up to. Show starts at 7 p.m. No admission charged, but free will donations are welcome to support ongoing Town Hall renovations. Lots more info in the press release, which I'm pasting at the end of this post. Promotional art for Vernon and Irene Castle. • Sunday, Sept. 17 brings me to Connecticut, where I'll present an unusual silent film program as part of a Vintage Dance Weekend taking place in and around Hartford. 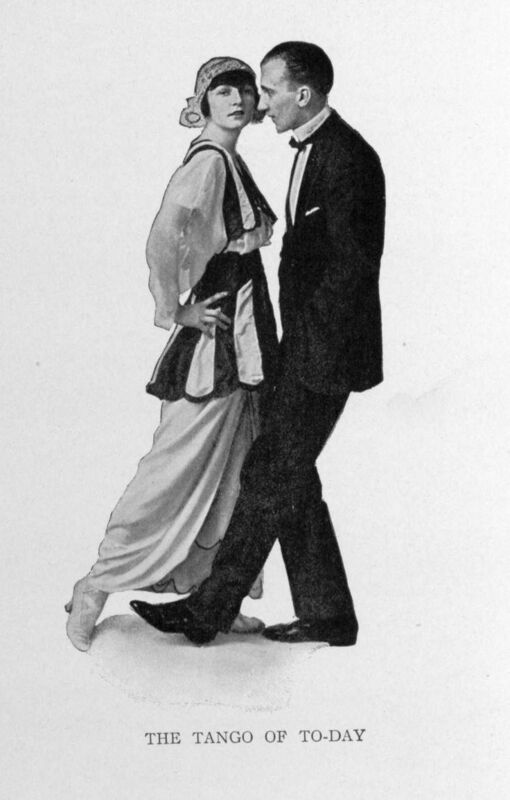 Featured attraction is 'The Whirl of Life' (1915), an obscure early drama but one starring no less than Vernon and Irene Castle, the ballroom dance sensation of the decade! I hadn't known much about the Castles until the organizers of this screening asked me to run this title as the featured attraction. Turns out the Castles were quite the shooting stars, rocketing to fame in 1914 in the first-ever Broadway musical by an up-and-coming composer named Irving Berlin. Among other accomplishments, they popularized the foxtrot, and of course the film has scenes of them doing the dance that remains a ballroom staple. Okay, everyone: Slow, slow, quick quick! Preceding 'Whirl' is a classic Charley Chase farce, 'Mighty Like a Moose' (1926), which also has some dancing in it, plus a lot of other great stuff. Should be a fun program at Hartford's Charter Oaks Cultural Center, and it's actually open to the public—even to non-vintage-dance folks. If you'd like to attend, there's more info at this Constant Contact page. Okay, a busy week beckons. But first, let me follow through with the promised press releases, first for 'Tol'able David' and then for the Houdini program. Hope to see you at one or two—or perhaps you'll attempt to collect all four! ARLINGTON, Mass.—A film that helped Hollywood understand the power of location shooting will continue this season's silent film series at the Capitol Theatre in Arlington, Mass. 'Tol'able David' (1921), a coming-of-age drama starring Richard Barthelmess, will be shown on Thursday, Sept. 14 at 8 p.m. at The Capitol Theatre, 204 Massachusetts Ave., Arlington, Mass. Admission is $12 adults, $10 kids and seniors. Live music will be provided by accompanist Jeff Rapsis, a New England-based performer who specializes in creating music for silent film presentations. Barthelmess plays the title role of David Kinemon, an adolescent eager to prove to the community that he's a man. He gets his chance when three escapees from jail come to town and menace the local residents. When push comes to shove, who will emerge on top? 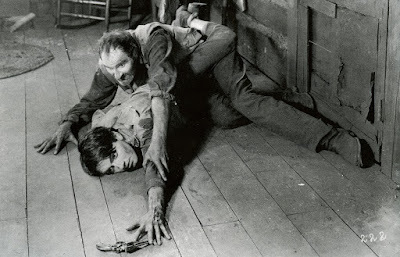 Based on a 1919 short story by author Joseph Hergesheimer, 'Tol'able David' was directed by Henry King, then at the start of a long Hollywood career that would go on include such later classics as 'Twelve O'Clock High' (1949) and 'The Gunfighter' (1950), both starring Gregory Peck. Boyish leading actor Barthelmess, one of the silent era's superstars and the Leonardo DiCaprio of his day, won praise for his realistic portrayal of a 15-year-old, although he was 25 at the time the film was made. The cast also features character actor Ernest Torrence, who transformed the role of Luke Hatburn into what some critics have called one of the most sinister villains in all of cinema. For 'Tol'able David,' director King insisted the film be shot on location in rural Virginia, where the story was set and where he grew up in the 1890s. Much of 'Tol'able David' was filmed in the countryside within a few miles of the director's boyhood home in Staunton, Va., and as a result was infused with the spirit and details of a vanishing way of life that King knew so well. The film is full of the simple rituals of small-town life as it was lived a century ago, when most people lived on subsistence farms ruled by the rhythms of nature and without modern conveniences. To create a musical score for 'Tol'able David,' Rapsis will improvise using material assembled beforehand, using a digital synthesizer to recreate the sound and texture of a full orchestra. "What I try to do," Rapsis said, "is create music that bridges the gap between a film that might be nearly a century old, and the musical expectations of today's audiences." 'Tol'able David' continues a monthly series of silent films presented with live music at the Capitol. The series provides local audiences the opportunity to experience silent film as it was intended to be shown: on the big screen, in good-looking prints, with live music, and with an audience. “These films are still exciting experiences if you can show them as they were designed to be screened,” Rapsis said. • Thursday, Oct. 19, 2017, 8 p.m.: 'Der Golem' (1922). Prepare for Halloween with one very weird flick! In 16th-century Prague, a rabbi creates a giant creature from clay, called the Golem. Using sorcery, he brings the creature to life in order to protect the Jews of Prague from persecution. Early German fantasy film anticipates Frankenstein story. Richard Barthelmess and Ernest Torrence star in 'Tol'able David' (1921), to be shown on Thursday, Sept. 14 at 8 p.m. at The Capitol Theatre, 204 Massachusetts Ave., Arlington, Mass. Admission $12 adults, $10 kids and seniors. For more info, call (781) 648-6022 or visit www.capitoltheatreusa.com. Houdini and crew on location at Niagara Falls for 'The Man From Beyond' (1922). BRANDON, Vt.—He reigned for decades as the legendary "Handcuff King," famous for his daring and impossible escapes staged around the world. But Harry Houdini also had a brief career in the movies, starring in a series of silent adventure films that showed off his athletic prowess as his talent for illusion, stunts, and escape. See Houdini back on the big screen with a double feature of two of his surviving films on Saturday, Sept. 16 at 7 p.m. at Brandon Town Hall and Community Center, Route 7, in Brandon, Vt. Admission is free, with donations welcome. All proceeds support ongoing restoration of the Town Hall, which dates from 1860 and is being brought up to modern standards as funds allow. The screening is sponsored by an Anonymous Donor. The rarely screened Houdini films will be shown with live musical accompaniment by Jeff Rapsis, a New Hampshire-based performer regarded as one of the nation's leading silent film musicians. Houdini made only a handful of movies in the 1910s and 1920s, and much of his film work is lost. But enough of it escaped oblivion to provide a glimpse of the world-renowned escape artist at the peak of his worldwide fame. In 'Terror Island' (1920), Houdini stars as a swashbuckling inventor who steers his high-tech submarine to a forbidden tropical isle to rescue the woman he loves. The film includes underwater sequences designed to show off Houdini's ability to survive being submerged for long periods of time. 'Terror Island' was an ambitious production for Houdini; the film was directed by James Cruze and released by Paramount. Existing copies are missing about 20 minutes of footage but the story remains easy to follow. In 'The Man From Beyond' (1922), Houdini plays a man frozen 100 years in the Arctic who returns to civilization to reclaim his reincarnated love. Once thawed out, Houdini tries to straighten out the lives of the descendants of his old friends and lost loves. 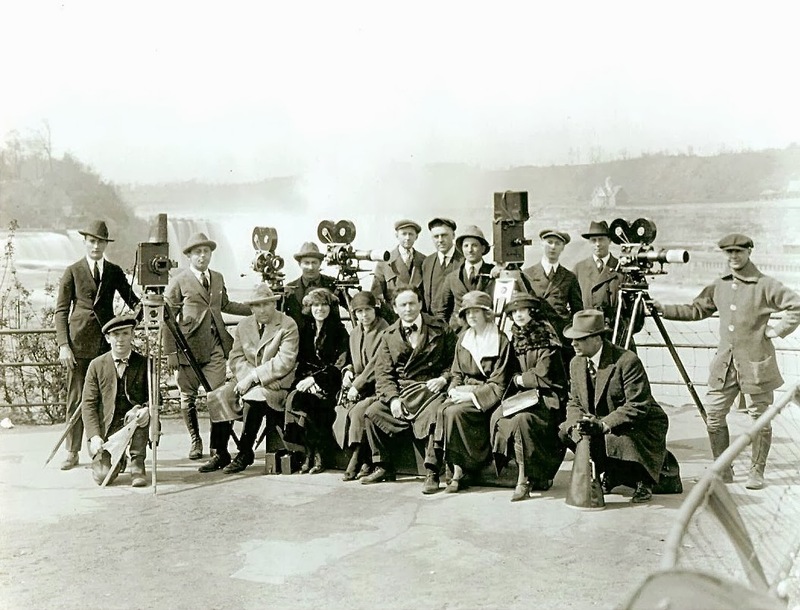 The film includes a daring climax filmed at Niagara Falls. Although Houdini's films were well-received, he eventually abandoned his movie career, preferring to concentrate on live performance. Houdini, born Erik Weisz, was a Hungarian-born, American-Jewish illusionist and stunt performer noted for his sensational escape acts. He first attracted notice in vaudeville in the U.S. and then as "Harry Handcuff Houdini" on a tour of Europe, where he challenged police forces to keep him locked up. Soon he extended his repertoire to include chains, ropes slung from skyscrapers, straitjackets under water, and having to escape from and hold his breath inside a sealed milk can with water in it. In 1904, thousands watched as he tried to escape from special handcuffs commissioned by London's Daily Mirror, keeping them in suspense for an hour. In 1913, Houdini introduced the Chinese Water Torture Cell, in which he was suspended upside-down in a locked glass-and-steel cabinet full to overflowing with water, holding his breath for more than three minutes. He would go on performing this escape for the rest of his life. Houdini died prematurely in 1926, at age 52, of peritonitis following a burst appendix that may have been caused by blows received to the abdomen by a visitor backstage at a performance in Montreal. Following his death, Houdini's reputation as a legendary performer continued to make his name a household world in the decades that followed. 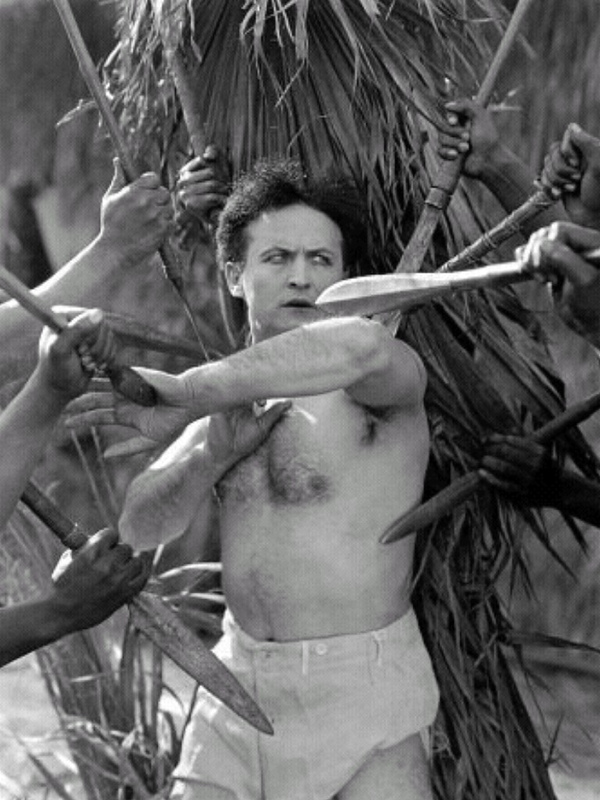 Although not well known as a film actor, Houdini's work in motion pictures was not forgotten. In a posthumous ceremony on Oct. 31, 1975, Houdini was given a star on the Hollywood Walk of Fame at 7001 Hollywood Blvd. Houdini is one of several "big name" performers featured on this year's silent film program at Brandon Town Hall. "These films are audience favorites, and people continue to be surprised at how engrossing and exhilarating they can be when shown as they were intended: in a theater, and with live music," said Rapsis, who accompanies more than 100 screenings each year at venues around the nation. • Saturday, Oct. 21: Chiller Theatre, 'Dr. 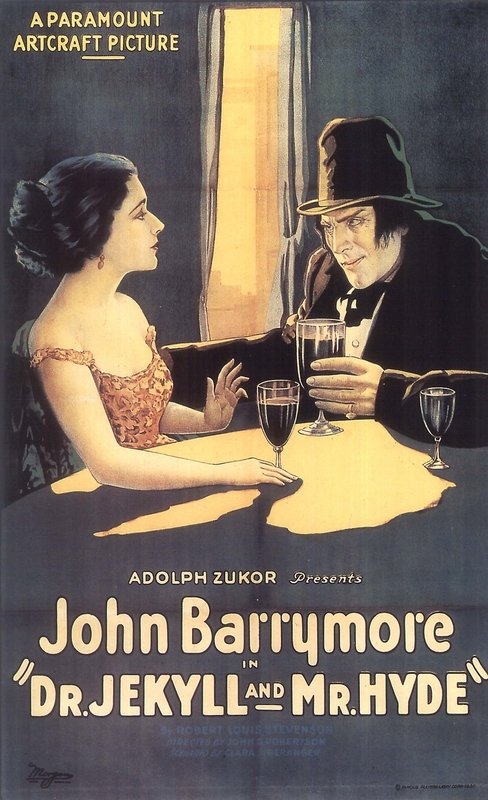 Jekyll and Mr. Hyde' (1920). 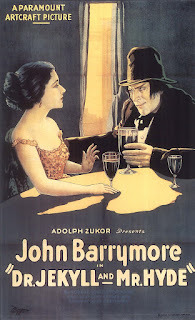 John Barrymore plays both title roles in the original silent film adaptation of the classic novella by Robert Louis Stevenson. A spook-tacular performance that helped establish Barrymore as one of the silent era's top stars. Sponsored by an Anonymous Donor and Heritage Family Credit Union. A 'Harry Houdini Double Feature' will be shown with live music on Saturday, Sept. 16 at 7 p.m. at Brandon Town Hall and Community Center, Route 7, in Brandon, Vt. Admission is free; free will donations are encouraged, with proceeds to support ongoing renovation of the town hall. For more information, visit www.brandontownhall.org. 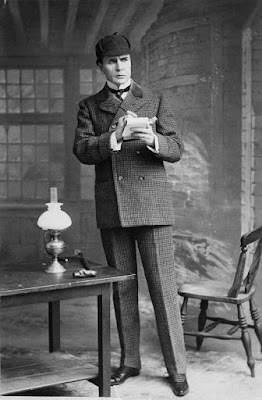 William Gillette as Sherlock Holmes. As a teenager, I read Walter Kerr's great book 'The Silent Clowns,' in which Mr. Kerr suggested it was getting very late for any missing silent film to turn up. That was in 1975. Thankfully, his assessment hasn't been quite on the mark, as significant lost films continue to be rediscovered even now, two generations later. Recent finds include the complete final reel of Laurel & Hardy's pie fight comedy 'Battle of the Century' (1927), and troves of U.S. films found in archives ranging from Amsterdam to New Zealand. 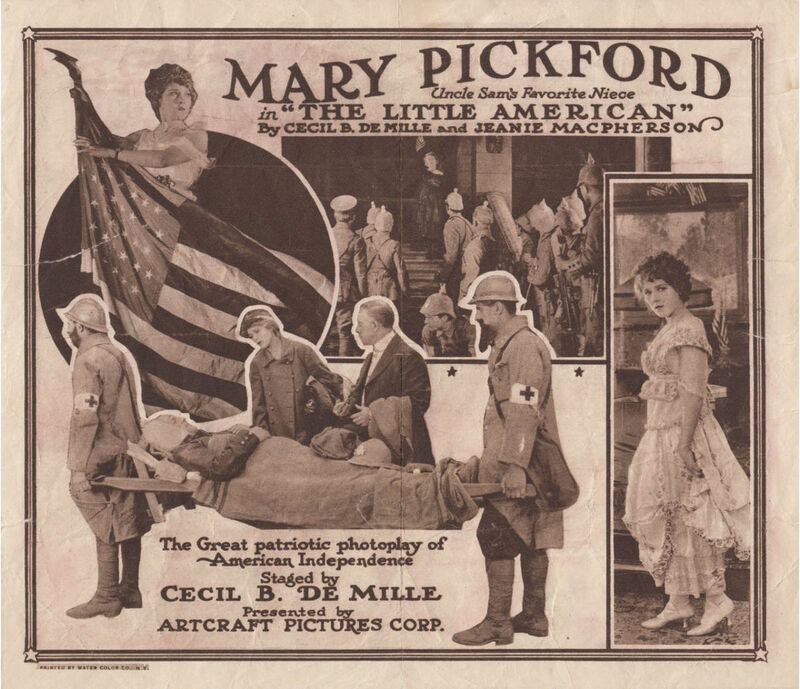 Even in my little corner of the world (New Hampshire, U.S.A.), we've seen discoveries that include the only known copy of Mary Pickford's first credited appearance in 'Their First Misunderstanding,' a 1911 one-reeler. But the most impressive re-emergence in recent times, I think, is a long-lost movie that turned up complete in 2014 in the Cinémathèque Français. For nearly a century, not a trace of this film was known to exist. But since it was found complete among other Holmes-related materials in the Cinematheque's archives, it's since been restored and can now be seen for the first time since Warren G. Harding was in the White House. I had the honor (and the pleasure) of accompanying the restoration last year up at Northeast Historic Film in Bucksport, Me., where it earned a huge ovation. And now it's time for the Boston-area premiere, which will take place this weekend: on Sunday, Sept. 10 at 2 p.m. at the Somerville Theatre, Davis Square, Somerville, Mass. It's notable in part because it's the only film appearance of Gillette, an immensely popular (and influential) actor man of the theater for several decades on either side of 1900. In creating 'Sherlock Holmes' for the stage, Gillette collaborated with author Arthur Conan Doyle (often by telegram from America to England) to develop the script and portray the character. And he then went on to star as 'Sherlock Holmes' for more than three decades, racking up more than 1,300 performances in the U.S. and Europe. In doing so, Gillette set the template for all actors who would portray Holmes from then on, from Basil Rathbone right down to Benedict Cumberbatch. Alas, Gillette was one of those stage actors who remained loyal to the theater, never getting involved with what was known as the "flickers" early on. So, with Gillette's only filmed appearance missing from the record, Holmes scholars and fans had no real sense of the actor's crucial contribution to the ever-growing Holmes legend and industry. See for yourself where the adventures of Sherlock Holmes started for so many: with William Gillette's portrayal of the iconic detective. Along the way, you'll meet the original Dr. Watson, and many other characters, including the eternal Holmes nemesis, Professor Moriarty. And I'm pleased to say that we'll be showing the restored 'Sherlock' via a newly struck 35mm print, which at first wasn't going to be produced. Rob Byrne of the San Francisco Silent Film Festival, who led the restoration effort, told me two years ago that 'Sherlock' would only be available via DCP, the digital cinema format. Well, something changed, as there's a 35mm print of 'Sherlock' at the Somerville Theatre right now, in the capable hands of projectionist David Kornfeld. Yay! So please join us. The restored 'Sherlock Holmes' will entertain and beguile you. It might also stir hope that yet more missing films will reappear, and even inspire you to look. Anyone have a copy of 'London After Midnight' (1927) in their basement? Here's the press release that went out, with more info about the film and the screening. See you there! 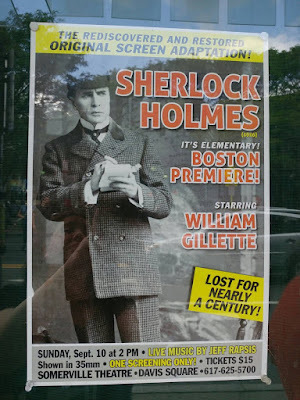 SOMERVILLE, Mass.—The first-ever movie adaptation of 'Sherlock Holmes,' a silent film released in 1916 and recently rediscovered, will screen in September at the Somerville Theatre. The original 'Sherlock Holmes' will be shown in 35mm with live music on Sunday, Sept. 10 at 2 p.m. at the Somerville Theatre, 55 Davis Square, Somerville, Mass. Admission is $15 per person/$12 students and seniors. The screening, part of the Somerville's 'Silents, Please' series, marks the Boston premiere of the recently rediscovered feature film, long considered a celluloid "Holy Grail" film scholars and Holmes fans alike. Like many films from the silent era, the original 'Sherlock Holmes' movie was long considered completely lost until a nearly complete copy was discovered in 2014 at the Cinemathique Francaise in Paris. 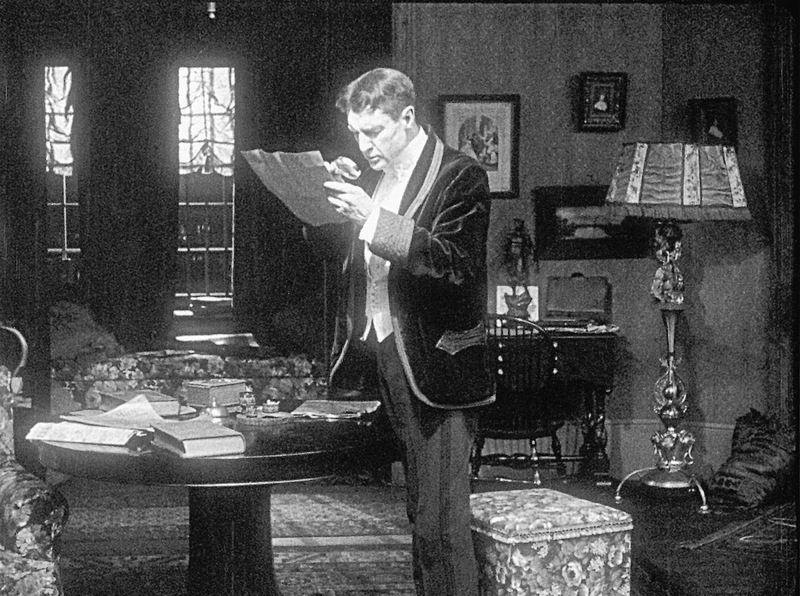 The film has since been restored, allowing movie-goers to again see the only screen appearance of legendary stage actor William Gillette in his most famous role. 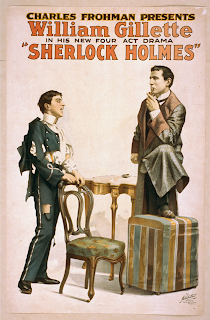 Gillette originated the role of Sherlock Holmes in a popular stage adaptation, collaborating with writer Arthur Conan Doyle to create the script and flesh out the character. 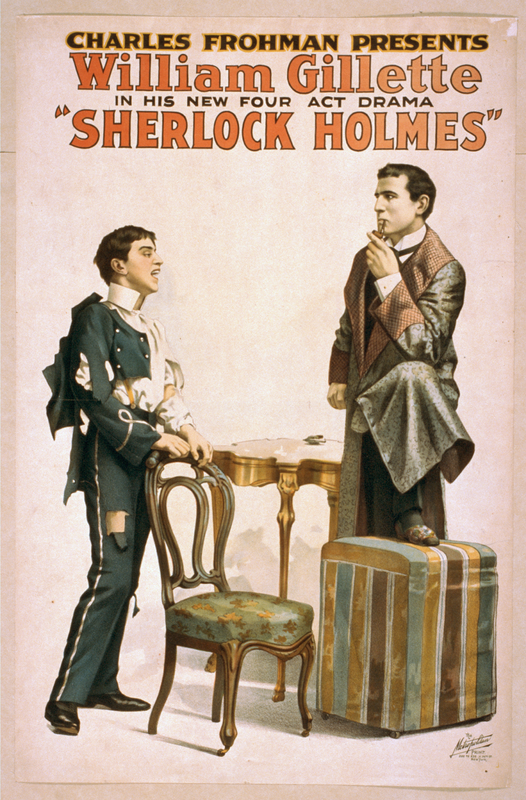 Gillette performed as the brilliant Holmes more than 1,300 times over three decades, touring the U.S. and Europe and popularizing Conan Doyle's sleuth. A highly regarded stage actor, Gillette made no other known movie appearances. But his interpretation of the Holmes character laid the groundwork for all actors who would later play the role, from Basil Rathbone to Benedict Cumberbatch. 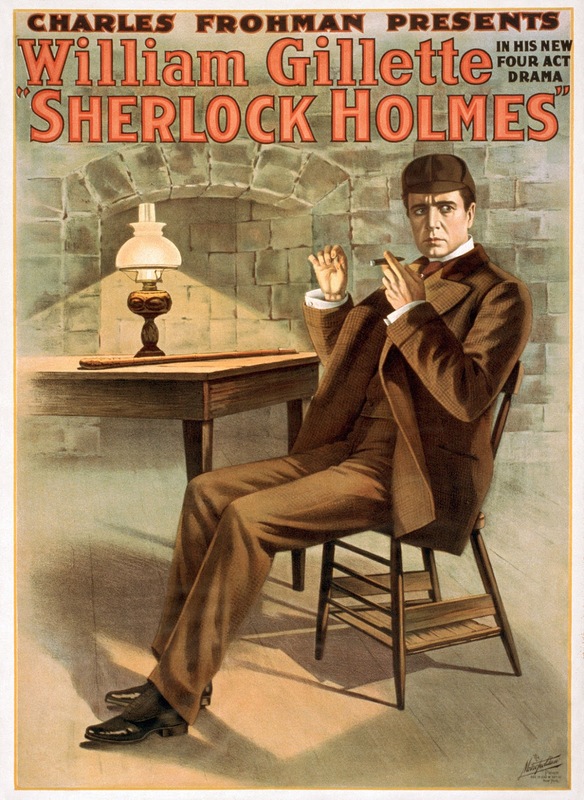 Set in Victorian-era London, the original 'Sherlock Holmes' movie is an episodic crime drama that incorporates the plots of several Conan Doyle tales. Running about 90 minutes, it features all major characters of the Holmes stories, including companion Dr. Watson and nemesis/rival Prof. Moriarty. It was filmed in 1915 in the Chicago studios of the Essanay Film Co., with exterior shots of the Windy City doubling for Victorian London. The restoration was premiered at the San Francisco Silent Film Festival. The screening at the Somerville Theatre will be the first time the restoration has been shown in the Boston area. "We're proud to be one of the few venues using the 35mm print of the restoration that's recently been made available," said Ian Judge, the Somerville Theatre's general manager. "We remain committed to showing classic film on actual film whenever possible, and we're thrilled to bring 'Sherlock' to Boston in the traditional 35mm format." 'Sherlock Holmes' will be shown with live musical accompaniment by Jeff Rapsis, a New Hampshire-based performer regarded as one of the nation's leading silent film musicians. The original ‘Sherlock Holmes' (1916), starring William Gillette in the title role, will be shown in 35mm with live music on Sunday, Sept. 10 at 2 p.m. at the Somerville Theater, 55 Davis Square, Somerville, Mass. Admission is $15 adults, $12 students/seniors; general admission seating. For more information, call (617) 625-5700 or visit www.somervilletheatre.com. For more info on the music, visit www.jeffrapsis.com. A glass slide promoting 'Raffles the Amateur Cracksman' (1917). A few notes from the just-concluded Western New York Film Expo and Movie Memorabilia Show, which took place over Labor Day weekend in Buffalo, N.Y. The four-day schedule of film screenings included a good numbers of silents, which I was on hand to accompany. Best of all, however, was the chance to catch up with so many people in the vintage film community. Attendees this time around included Cynthia Cozart, wife of film restoration expert James Cozart, who recently passed away. And Gerry Orlando, longtime organizer of Cinefest down the road in Syracuse, N.Y., stopped in for a visit! 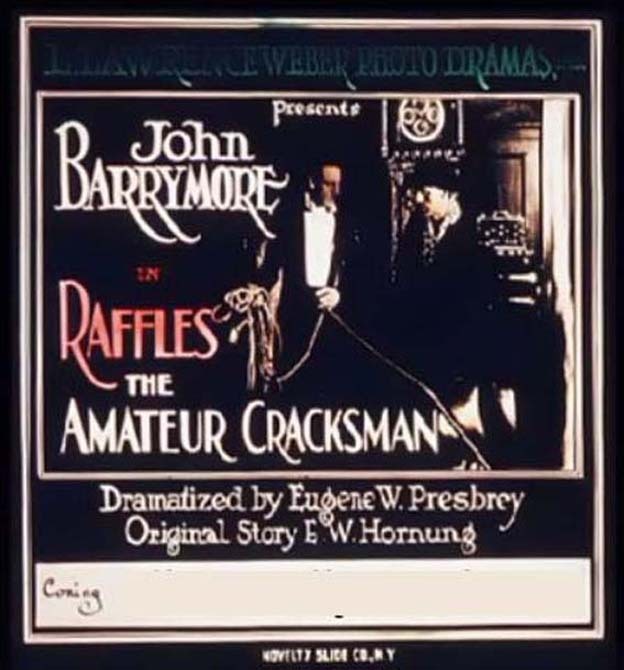 Silent titles included 'Raffles the Amateur Cracksman' (1917), an early John Barrymore feature in which Staten Island substitutes for the British countryside. 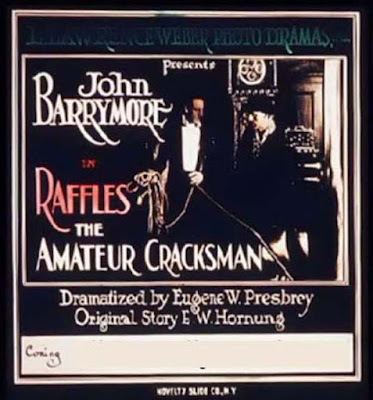 But as sometimes happens, 'Raffles' turned out to be really entertaining, with Barrymore in fine form playing cat and mouse with a hard-nosed detective. A lot of fun! Also of interest was an original Kodascope print of 'The Lost World' (1925), the legendary "dinosaur" film adapted from Sir Arthur Conan Doyle's story. The print looked fantastic: sharp and clear with great tonal values and really easy on the eyes. But most interesting to me was how the film was abridged. Like many Kodascope prints made for the home market, it was cut down. In its original release, 'The Lost World' ran 106 minutes. But the Kodascope version clocks in at just 55 minutes. I'm familiar with 'Lost World' restorations that have tried to be as complete as possible, but had never encountered the Kodascope edition. So prior to the screening, I told audience members to expect what amounts to a "dinosaur highlight reel." And so it was! The basic plot was followed, but most of the character development was excised so the film could get straight to the dinosaur scenes. It still got a great reaction, which was nice. But I found it hard to accompany because I would be setting up for one scene that I expected, but then the film would suddenly jump way ahead! It was like trying to dance to a record that keeps skipping. A lobby card for 'Hot Water' (1924). 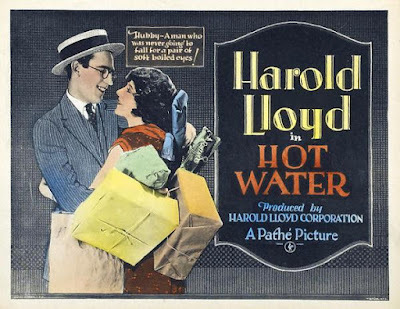 A personal highlight was 'Hot Water' (1924), the only Harold Lloyd silent feature film that I'd never had a chance to accompany live. Really! I've done all the others, some many times. I've even accompanied the rare silent version of 'Welcome Danger' (1929), which Lloyd reshot and released as a talkie. So with 'Hot Water,' I could say I was hitting for the cycle. And what's odd about that is that 'Hot Water' was actually the very first Lloyd feature I ever got to see, although in truncated form. That's because I was first exposed to the Lloyd features via the Time-Life 1970s re-edits of the films, which ran on PBS when I was a teenager. It's a good comedy, but generally regarded as one of Lloyd's lesser efforts. As such, it almost never gets shown. And over the years, I've wound up accompanying all the Lloyds except this one. Well, that changed at this year's N.Y. Film Expo, where I created music for it as 'Hot Water' (via another sparkling 16mm print) drew big laughs. Also on the bill were Keaton's classic feature comedy 'The Navigator' (1924), and also Gloria Swanson's costume vehicle 'Zaza' (1923). The latter was recently brought out on DVD/Bluray by Kino-Lorber with a recorded score by me. So it was a special privilege to recreate the music live at this year's N.Y. Film Expo. Response was gratifying and I received many nice comments afterwards. So thanks to organizer Alex Bartosh and everyone associated with the N.Y. Film Expo. Nice to see a lot of familiar faces, and looking forward to the next edition of the event, which is set for Labor Day Weekend 2018!